Another beautiful day dawned as I made my way from Southfields, near Wimbledon, to Banbury Station in Oxfordshire and thence to the home of my niece, Sarah and her family. Sarah was just pulling up in the car park with Minnie as I emerged and we caught up a little with the news as she drove us home. Once again, it's been a long time since we were together because I haven't been in England for four years. But, as is nearly always the case with very close friends and relations, nothing had changed except that all the children were, of course, four years taller! 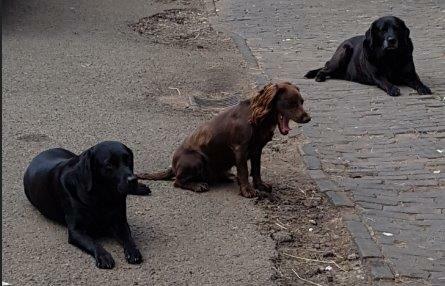 Two of the dogs, labradors Crumpet and her daughter, Domino, rushed out to meet me, joined on this occasion by Cadbury, Will's working Cocker Spaniel. I've missed Jessie so much since she died and it was special to have three very loving canines vying for attention and staying very close by for as many strokes as possible. 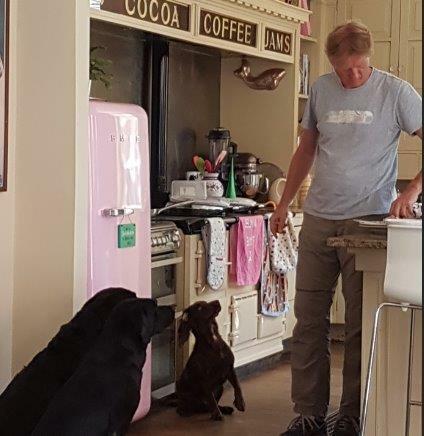 Rupert, watched very closely by the dogs, had taken charge of Sunday lunch and we decided to have it inside as the sun was beating down relentlessly and it was very hot indeed. And then, because it was men's finals day at Wimbledon, we all enjoyed the wonderful lunch and then disappeared to relax and enjoy the tennis as well as (very small doses of) the finals of the Soccer World Cup match between France and Croatia, won by France 4-2. 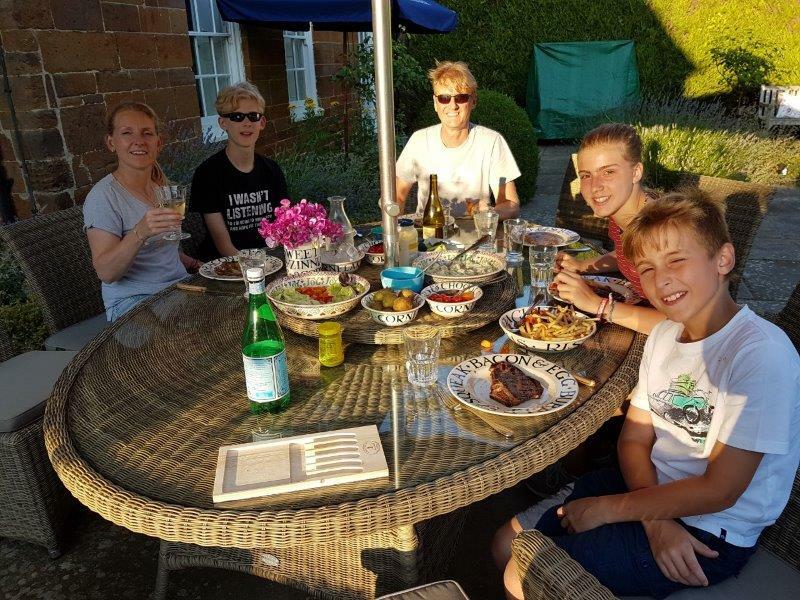 As the sun sank lower in the sky and the temperature began to drop just a little, Rupert fired up the BBQ and we all enjoyed a lovely BBQ al fresco. 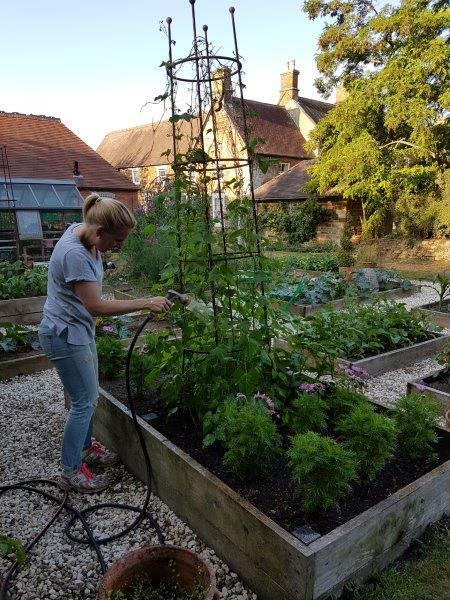 Because of the very hot weather, Sarah has had to work hard to keep the garden watered, especially having developed wonderful raised both flower and vegetable gardens so the evening didn't end for her with enjoying dinner - she was wielding a hose for some hours afterwards! Fortunately the hose bans haven't started in England yet although the water situation is becoming very serious. 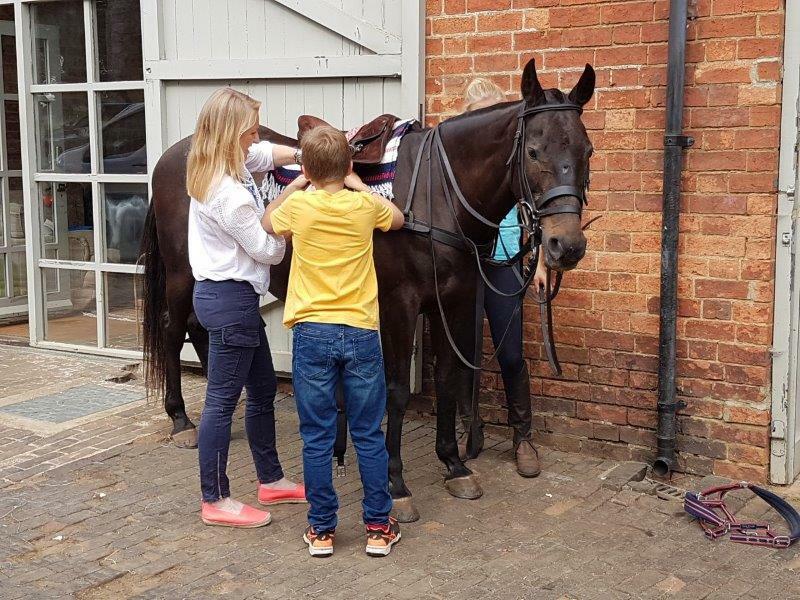 Horses play a large part in Sarah's life and both Minnie and Archie share her love of riding, Will less so. 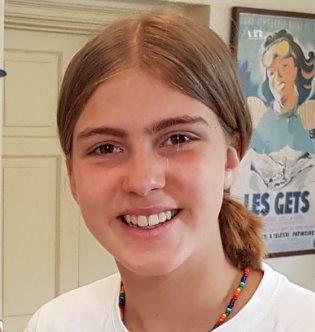 She spends a lot of time with the children, teaching them all about proper animal husbandry as well as hours spent riding, cleaning tack, and generally making sure that the horses get the best care possible. 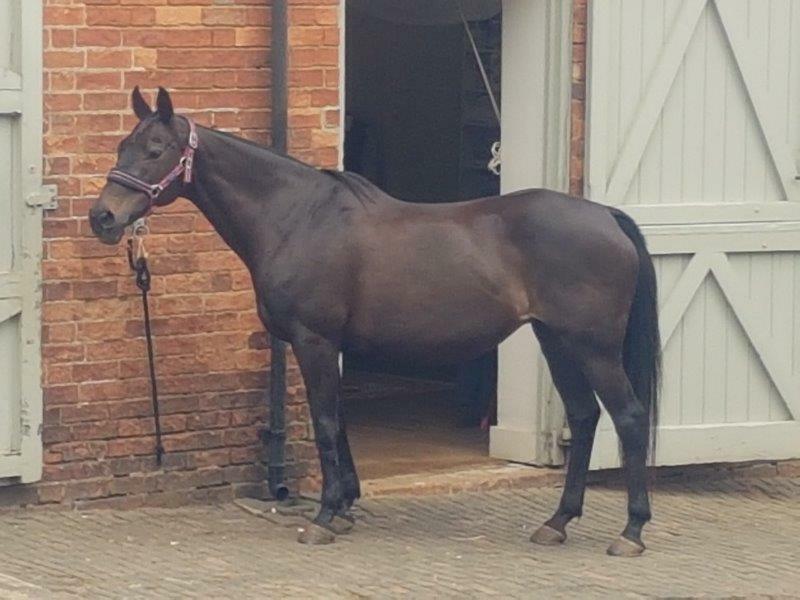 She has her own horse called Mischief. Minnie's is called Doogie,although she is injured at the moment. Archie has shown considerable promise on the polo fields and his horses are called Elusion (shown here) and Titch. They are both exercised every day and he plays polo about twice a week all over the country. He's only 11 but has already decided that he'd like to become a professional polo player and live in Argentina! And so we passed a really lovely and relaxing weekend. 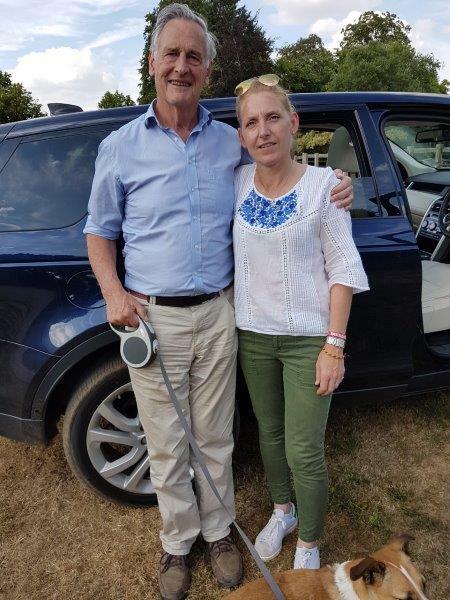 Sadly Rupert had to return to London on Sunday evening for the working week and Minnie left us on Monday afternoon to spend a week with one of her best friends and her family in France. Before she left, however, Sarah's godfather and my 1960s mixed doubles tennis partner, James, arrived for lunch and inevitably there were even more reminiscences. 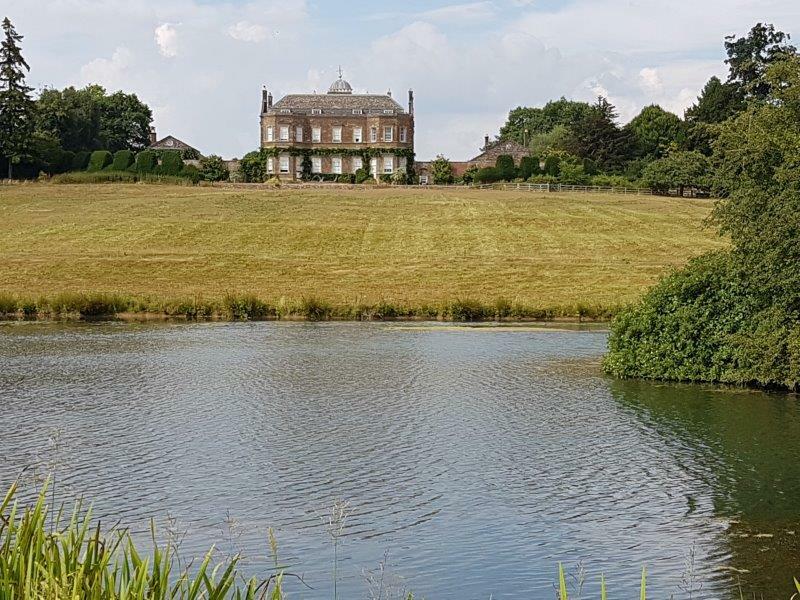 With Minnie safely 'despatched' to travel to the airport with her friends, we set off to explore Thenford House nearby and enjoyed a lovely walk around part of the estate. Exercise over, it was time for James to make his way home. 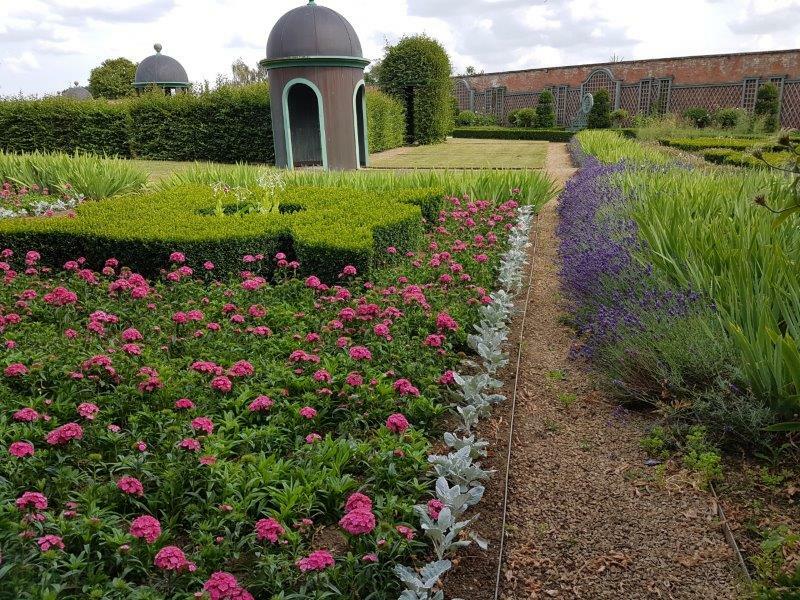 Surprisingly, although Sarah and James live fairly close to each other, they hadn't been in touch as often as they would have liked so a little time was spent making plans for lots of possible meetings in the next few months. We, too, had to make our way back so that Sarah and Archie could spend an hour or two dealing with the horses.It's amazing how long it takes to give them the care they need, particularly in the very hot weather and Sarah won't relax until she knows they're safe and cared for. 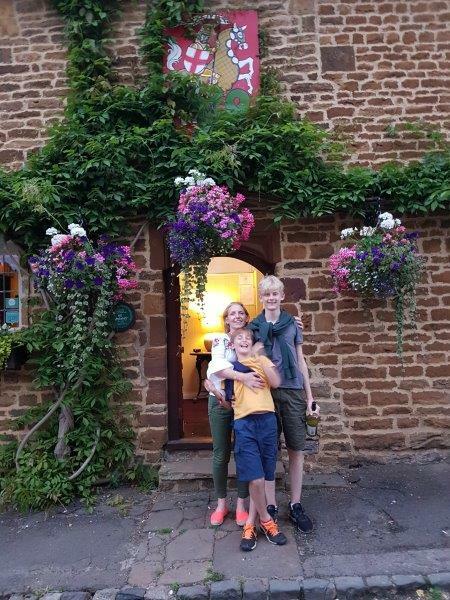 Dogs fed and tucked up safely inside, it was a fitting end to a lovely weekend to go out to dinner at a local pub for my last evening with Sarah, Will and Archie. 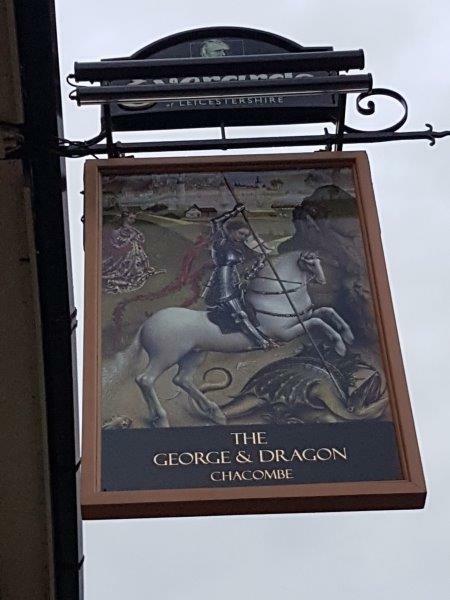 There's nothing that compares with a good English pub and this one is their 'local'. The food was lovely and the ambience second to none. And it was fascinating to hear all about Will's impending departure on Thursday for Namibia where he is going to be part of a school expedition that sounds like the trip of a lifetime. Original generation time 1.3758 seconds. Cache Loaded in: 0.0380 seconds.